Amadeo Bordiga writes on the German and Russian revolutions for an Italian audience, Il Soviet, 21 September 1919. Two of the articles in our last issue, one devoted to an analysis of the communist system of representation and the other to an exposition of the current tasks facing our Party, concluded by asking whether it is possible or appropriate to set up workers' and peasants' councils today, while the power of the bourgeoisie is still intact. Comrade Ettore Croce, in a discussion of our abstentionist thesis in an article in Avanti!, asks that we should have a new weapon at the ready before getting rid of the old weapon of parliamentary action and looks forward to the formation of Soviets. In our last issue we clarified the distinction between the technical-economic and political tasks of the Soviet representative bodies, and we showed that the true organs of the proletarian dictatorship are the local and central political Soviets, in which workers are not sub-divided according to their particular trade. The supreme authority of these organs is the Central Executive Committee, which nominates the People's Commissars; parallel to them, there arises a whole network of economic organs, based on factory councils and trade unions, which culminate in the Central Council of the Economy. In Russia, we repeat, whereas there is no trade representation in the CEC and Soviet of Soviets, but only territorial representation, this is not the case as regards the Council of the Economy, the organ which is responsible for the technical implementation of the socialization measures decreed by the political assembly. In this Council, trade federations and local economic councils play a role. The 16 August issue of L'Ordine Nuovo contained an interesting article on the Soviet-type system of socialization. This article explained how in a first stage, dubbed anarcho-syndicalist, the factory councils would take over the management of production, but that subsequently, in later stages involving centralization, they would lose importance. In the end they would be nothing more than clubs and mutual benefit and instruction societies for the workers in a particular factory. 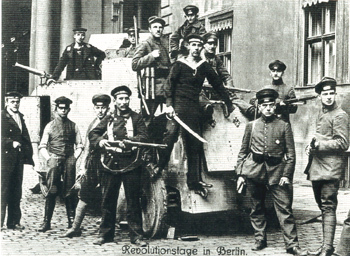 If we shift our attention to the German communist movement, we see in the programme of the Spartacus League that the Workers' and Soldiers' Councils, the bodies which are to take the place of the bourgeois parliaments and municipal councils, are quite different from factory councils, which (Art. 7 of Section III) regulate working conditions and control production, in agreement with the workers' councils, and eventually take over the management of the whole enterprise. In Russian practice, factory management was made up to the extent of only one-third by representatives from the factory council, one-third by representatives from the Supreme Council of the Economy, and one-third by representatives from the Central Federation of Industry (the interests of the work-force, the general interests of society, and the interests of the particular industrial sector). In Germany again, elections to the Workers' Councils are arranged in accordance with the formula: one council member to every 1,000 electors. Only the large factories with over 1,000 workers constitute a single electoral unit; in the case of small factories and the unemployed, voting takes place in accordance with methods established by the electoral commission in agreement with various trade organizations. It seems to us that we have marshalled enough evidence here to be able to declare ourselves supporters of a system of representation that is clearly divided into two divisions: economic and political. As far as economic functions are concerned, each factory will have its own factory council elected by the workers; this will have a part to play in the socialization and subsequent management of the plant in accordance with suitable criteria. As far as the political function is concerned, that is to say the formation of local and central organs of authority, elections to proletarian councils will be held on the basis of electoral rolls in which (with the rigorous exclusion of all bourgeois, i.e. people who in any way whatsoever live off the work of others) all proletarians are included on an equal footing, irrespective of their trade, and even if they are (legitimately) unemployed or incapacitated. Bearing all this in mind, is it possible, or desirable, to set up Soviets now? If we are speaking of factory councils, these are already spreading in the form of internal commissions, or the English "shop stewards" system. As these are organs which represent the interests of the work-force, they should be set up even while the factory is still in the hands of private capital. Indeed it would certainly be to our advantage to urge the setting up of these factory councils, although we should entertain no illusions as to their innate revolutionary capacity. Which brings us to the most important problem, that of political Soviets. The political Soviet represents the collective interests of the working class, in so far as this class does not share power with the bourgeoisie, but has succeeded in overthrowing it and excluding it from power. Hence the full significance and strength of the Soviet lies not in this or that structure, but in the fact that it is the organ of a class which is taking the management of society into its own hands. Every member of the Soviet is a proletarian conscious that he is exercising dictatorship in the name of his own class. If the bourgeois class is still in power, even if it were possible to summon proletarian electors to nominate their delegates (for there is no question of using the trade unions or existing internal commissions for the purpose), one would simply be giving a formal imitation of a future activity, an imitation devoid of its fundamental revolutionary character. Those who can represent the proletariat today, before it takes power tomorrow, are workers who are conscious of this historical eventuality; in other words, the workers who are members of the Communist Party. In its struggle against bourgeois power, the proletariat is represented by its class party, even if this consists of no more than an audacious minority. The Soviets of tomorrow must arise from the local branches of the Communist Party. It is these which will be able to call on elements who, as soon as the revolution is victorious, will be proposed as candidates before the proletarian electoral masses to set up the Councils of local worker delegates. But if it is to fulfil these functions, the Communist Party must abandon its participation in elections to organs of bourgeois democracy. The reasons supporting this statement are obvious. The Party should have as members only those individuals who can cope with the responsibilities and dangers of the struggle during the period of insurrection and social reorganization. The conclusion that we should abandon our participation in elections only when we have Soviets available is mistaken. A more thorough examination of the question leads one instead to the following conclusion: for as long as bourgeois power exists, the organ of revolution is the class party; after the smashing of bourgeois power, it is the network of workers' councils. The class party cannot fulfil this role, nor be in a position to lead the assault against bourgeois power in order to replace parliamentary democracy by the Soviet system, unless it renounces the practice of despatching its own representatives to bourgeois organs. This renunciation, which is negative only in a formal sense, is the prime condition to be satisfied if the forces of the communist proletariat are to be mobilized. To be unwilling to make such a renunciation is tantamount to abandoning our posture of readiness to declare class war at the first available opportunity. Il Soviet, 21 September 1919, Vol. II, No.39.